In honor of Veterans Day, Virginia Tech and the National Archives will host a transcribe-a-thon to make accessible an unusual collection of wartime documents — 65,000 pages of uncensored reflections written by U.S. soldiers during World War II. The American Soldier in World War II transcribe-a-thon will take place on Virginia Tech’s Blacksburg campus on Nov. 12 and 13; at the National Archives in Washington, D.C., on Nov. 13; and around the world virtually Nov. 11–13. The project’s aim is to expand understanding of the common U.S. soldier’s experiences during World War II. The U.S. Army Research Branch, a social and behavioral sciences research division within the Armed Forces, began collecting these handwritten commentaries in the days following Japan’s attack on Pearl Harbor. 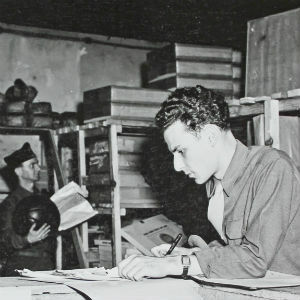 The division administered social surveys during the war to approximately 500,000 service members at points across the globe, from Iceland to the Persian Gulf. The surveys asked soldiers about the quality of rations, entertainment, and educational opportunities; training, medical care, housing, uniforms, and equipment; the conduct of Allied soldiers and commanding officers; and a multitude of other facets of their wartime experiences. With promised anonymity, the research branch encouraged participants to be candid, as their insights could help improve morale and fighting effectiveness. Gitre has led an interdisciplinary team of scholars, data scientists, and librarians in the creation of the project, which is leveraging human and artificial intelligence to make this one-of-a-kind collection broadly accessible. For nearly three-quarters of a century, the soldiers’ handwritten comments could be viewed only from microfilm readers located inside the National Archives in College Park, Maryland. The transcription of these records to a digital database is being orchestrated through the million-member-strong crowdsourcing platform of Zooniverse, a citizen-science web portal that allows volunteers to register and participate in the transcription process virtually. Once the handwritten documents have been transcribed, which is estimated to take two years, and reunited with the rest of the Army’s surviving survey data, the entire reconstituted collection will be made available through a free, open-access website. Gitre is encouraging other universities and organizations to host transcribe-a-thons of their own. Prospective hosts can learn about the genesis of both the U.S. Army Research Branch’s original social research and Virginia Tech digital initiative in “The American Soldier: A World War II Survey,” which Gitre published in Parameters, an online publication of the Social Science Research Council’s Digital Culture program. Support for this endeavor has been provided by the National Endowment for the Humanities, which awarded the project a startup planning grant; the National Archives; and the Social Science Research Council. The Blacksburg edition of the transcribe-a-thon will take place in Newman Library, 560 Drillfield Drive, on Nov. 12 from 9 a.m. to 3 p.m. in the Multipurpose Room and on Nov. 13 from 9 a.m. to 1 p.m. in Room 207A and from 8 to 11 a.m. and from 2 to 3:30 p.m. in the Athenaeum Classroom. The Washington, D.C., edition will take place at the Innovation Hub of the National Archives, 700 Pennsylvania Avenue, NW, on Nov. 13 from 9 a.m. to 5 p.m.